Back to School winner receives cinema voucher! During the Summer holidays Molsom & Associates supported SightCare and their wonderful competition "Back to school with healthy eyes". Any child having a sight test in August, at Molsom & Associates Spalding, got the opportunity to enter the competition. 10 winners would then be chosen at random, by SightCare, from the Nationwide entries from Independent Opticians. Each winner drawn receiving £30 of cinema vouchers! We were very happy to pass on the good news to our patient Ruth and her children that they had won one of the 10 vouchers! The photo below shows Ruth receiving the voucher from practice manager Gail Stovell. It was great to be able to hand over this treat to the family. We continue at Molsom & Associates to try and help educate everyone on the importance of regular eye examinations. Supporting local charities and community groups to deliver information on eye health, visiting pre schools and younger primary schools and providing interactive talks and supporting as many events as we can within the community. Having an eye examination is so much more than "looking to see if you need glasses". Early detection of many eye conditions is now possible with the advanced technology of our OCT scanning and experience of assessing these scans once complete. Diabetes, macular degeneration, glaucoma and many other conditions can be detected early and a treatment plan put into action. For any further information please call our friendly, experienced staff for more help 01775 713366. If you are involved in a local school or pre school and would like to book one of visits please call Bridget to discuss on 01775 713366 or email admin@molsom.co.uk. 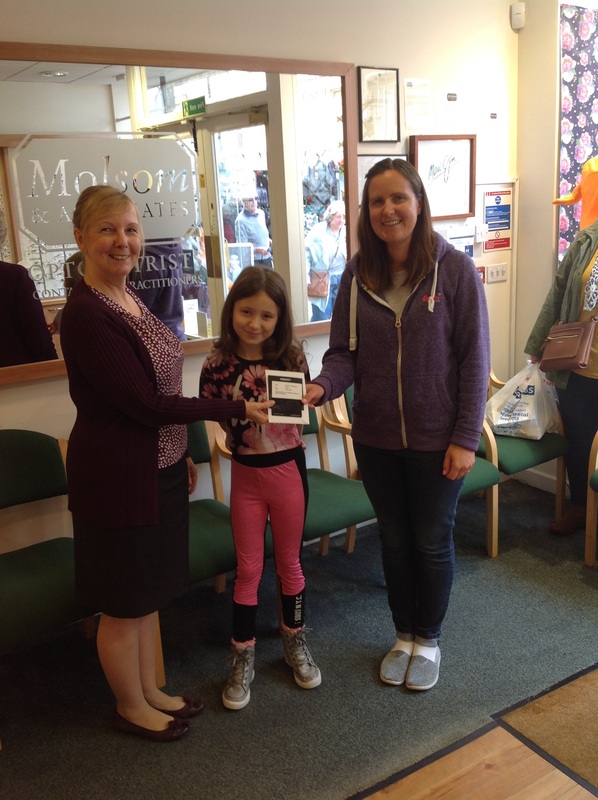 Practice manager, Gail handing Ruth and her daughter their cinema vouchers.